Icelandic farms have long formed the backbone of life on the island in the North Atlantic. Without farming and the livestock – primarily goats, sheep and cattle – which allowed the Icelanders to survive, making it through the winters of the medieval period was a grim prospect indeed. In fact, in the 1985 book Climate and History, Thomas H. McGovern’s chapter, “The Economics of Extinction in Norse Greenland,” tells us that Norse farms were closely associated with the lowland areas of the inner fjords and the comparatively lush floral communities those biomes supported. Large, well-built byres and hay barns all indicate that finding good pasture land for a herd of cattle, sheep, and goats was the determining factor in the location of the Norse farms. When Skallagrim´s flock grew in number, they were allowed to roam mountain pastures for the whole summer. Noticing how much better and fatter the animals were that ranged on the heath, and also that the sheep which could not be brought down for the winter survived in the mountain valleys, he had a farmstead built up by the mountain, and ran from there where his sheep were kept… In this way, Skalla-Grim put his livelihood on many footings. Archaeological finds all over Iceland seem to support the advice of the story that one should invest in a wide array of strategies to provide food for one’s family, and wealth and social standing in one’s holdings. In addition to animal husbandry in the form of cattle, pig, sheep and goats, the remains of many seabirds, bird eggs, walruses and even a Great Aurochs – just one – and of course the expected fish bones, seal and whale remains, are found at sites all over Iceland. These attempts to diversify became even more critical as the Little Ice Age swept across the world between starting around 1200, creating a colder, drier and windier climate overall. By 1300, the people of Northern Europe could no longer depend on warm summers and the growing season for plant life grew even shorter. Thus, dried fish with butter became a substitute for their daily bread, and dairy products became all the rage on most dinner tables, as it was one of the few plentiful and reliable sources of fat and protein for a hungry Viking. Another reason milk was delicious and nutritious to the medieval Scandinavian was that it could counteract the effects of scurvy, or vitamin C deficiency, brought about by the long weeks or months of winter darkness (sheep’s milk is particularly high in Vitamin C, followed by goat’s milk, while cow’s milk has none at all). In the 1997 article “Raiding the Landscape: Human Impact in the Scandinavian North Atlantic,” Thomas Amorosi et al. discuss the damage livestock could do to the land: “Cattle and goats could strip dwarf trees of leaves and bark, pigs efficiently tore up roots, and successive grazing of a subarctic woodland by horses, cattle, and sheep could rapidly roll back forests and prevent their regeneration.” Together, say the authors, these animals created a “Settlement package” that bulldozed the landscape of Iceland, turning it from a varied landscape of birch forests to wide grasslands vulnerable to erosion thanks to those Ice Age winds, only suitable for domestic herds within a few hundred years of the original settlement ca. 870 AD. One of the chief reasons the Nordic people continued to of expand into the islands of the North Atlantic and to Greenland was their need for extensive grazing land – although their attempts to duplicate the animal husbandry traditions of Norway and Denmark in Greenland are one of the chief reasons for the failure and eventual abandonment of the colony. This is one reason why many sagas also tell of heroes and rich landowners journeying to Norway to ask for wood, usually to build a church – there was precious little to be found in Iceland, as southern Iceland is in the boreal climate zone, while northern Iceland is in the low arctic. Once the settlers had cut down the trees to make the first houses, outbuildings, fences, and the all-important byres to shelter their animals in Iceland, they were surprised to see that trees didn’t grow back as quickly or dependably as they did in Norway, Sweden, and Denmark. These houses are familiar to anyone who has watched an episode of Vikings or munched popcorn through Antonio Banderas’ swashbuckling in The 13th Warrior: the longhouse, a part of Scandinavian life in some form since the Bronze Age. For this kind of building, a number of posts, put in pairs, supported the roof instead of the walls. The posts were made of wood, but the walls and roof could be made of whatever was most available in a given region, such as straw, turf or wood. 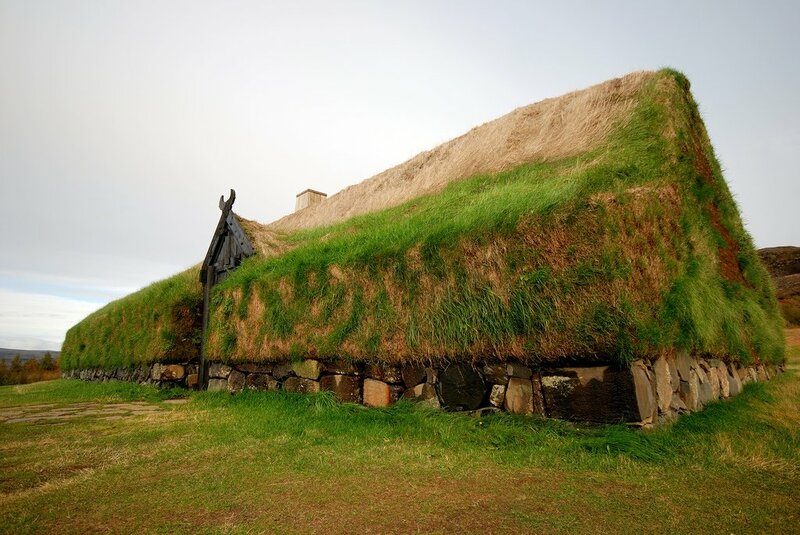 In Iceland’s case, that meant a lot of turf houses built in the medieval period, with wood returning in the early modern period. As Jan-Henrik Fallgren tells us in the chapter “Farm and Village in the Viking Age” in The Viking World, the houses could be separated into a number of different rooms, each of which had different functions. The longer the houses, which were usually between 5 and 50 meters long, the more rooms and functions could be performed inside. These multi-functional houses could contain a stable, kitchen, storerooms, rooms for entertaining and for living. Smaller farms were composed of as few as two or three buildings. These consisted usually of a main building, which housed a dwelling area with or without a stable, and one or two secondary buildings – often a stable or for storage. To conserve space and the life-saving warmth that a herd of animals might generate, the stable was dug under the living quarters in many Icelandic longhouses so that the whole family – animals included – could try not to freeze together in the winter. Sometimes there were also one or two pit-houses – small, partly dug-down buildings, which were used as workshops. The largest farms had between five to seven buildings. The main building was significantly larger than on the smaller farms, and the number of storage buildings, stables and workshops could be considerable. Closest to the house were hayfield enclosures, which were precious fodder to be used in winter to feed the animals. It was close to the home so that you could keep an eye on your supplies and tend it well. Outside the hayfields, which were protected from hungry animals, the weather and from thieves by walls, there were the animals that required the most care: cattle. If the farm was rich enough to have cattle (something which fell out of fashion throughout the medieval period as sheep were easier to care for), they needed to be milked often, fed well, and cared for diligently. Also pastured relatively nearby were the milking sheep, which required less care but were still vital for the family’s needs. Generally, a family with a large herd of sheep or goats would let their animals roam wherever they wanted in search of food in the summer. The women or men tasked with milking would then go to the sel, or mountain pasture, usually outfitted with a small cottage or milking shed, to perform their work. They would make this trip to the outer pastures as often as needed until it was time to bring the animals in again for the long, cold winter. Farm life in Iceland today is in many respects the same, though the barn has moved out from under the house and modern farm equipment has made it easier to grow hay in large quantities. In particular, farmers are proud to say that the Icelandic lamb has roamed the hills and mountains of Iceland freely ever since Viking settlers first brought sheep to the country. However, in the modern era, Iceland is facing some difficulty with its long-standing tradition of sheep farming. As reported by Paul Fontaine in The Reykjavík Grapevine, lamb may not be one of Iceland’s chief exports much longer. After 1000 years of farming and tending to their flocks, Icelanders may have developed a taste for something different.